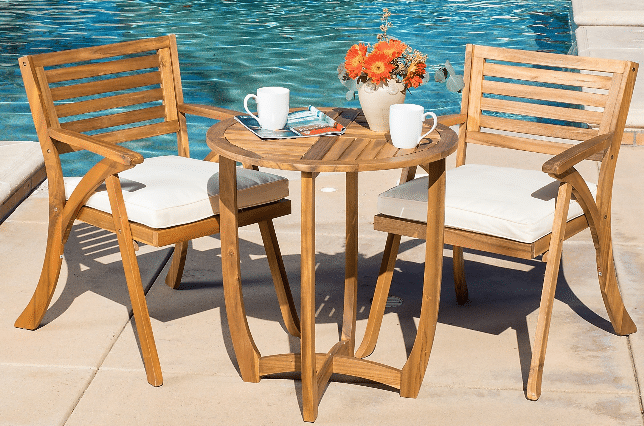 When looking for the perfect patio furniture for your outdoor space, you should put the patio furniture sets in teak on your list. The upfront cost is a little higher, the quality of the furniture and the ability to handle most any outdoor conditions will make this type of patio furniture outlive most of its owners. I have a post on teak wood and why it makes great patio furniture material here. Look around at the major resorts and look at their pool side furniture, it will be made of Teak furniture if it is a high end place. I have an article on what is Teak wood is all about, it is one of the best woods for outdoor furniture. If you like the look of the wood patio furniture like this, plain wood that will need to be painted will be the base cost. Treated wood furniture will be twice the cost of plain wood. If you upgrade to cedar, your cost will double from the treated wood. Redwood will double the cost from treated. 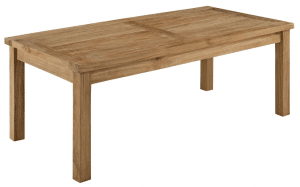 Now comes Teak wood furniture, this will double the cost from redwood furniture. Now you see the cost difference. 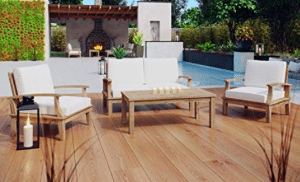 The big difference of Teak wood patio furniture will be that you will only have to treat the surface with an oil finish once a year to keep the natural wood color or if you desire you can leave it go to a gray patina for an antique look. This type of furniture is used at beach houses and will last very well in salty air conditions. 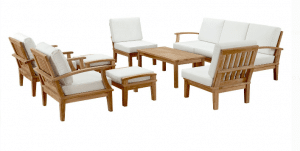 If you have a need for patio furniture and want some that will last a lifetime, look at the following Teak furniture options. If you have that extremely large outdoor space and want to make it look like an indoor room, the Modway Marina sofa set will fill that place with seating. This set can be purchased in several layouts and will fill most large outdoor spaces. The pieces available are Chairs, with and without arms, Ottomans and sofa pieces, You can get end sofa pieces with arms on one side if you do not rearrange your patio furniture often. My patio furniture moves too much for this type of end piece. Both style of chairs are 32.5 inches wide, 31.5 inches deep and 31.5 inches high. Use the arm less chairs to make a sofa, armed chairs to stand alone. Ottomans are 21 inches wide, 23.5 inches deep and 11 inches tall at top of cushions. The sides will have an arched teak wood arm in the same style as the chairs. This will help keep cushions in place. Matching coffee table is available in this style. It will be 47 inches long, 23.5 inches wide and 17.5 inches tall. It will have the slatted look from end to end with a wood boarder and central crossing piece. Straight legs on each corner will support this table. These pieces can be purchased in the quantities that your seating needs desire. Add a lounger available below and you can fill that big outdoor space with plenty of comfortable teak patio furniture seating. This set will work best for those with very large outdoor areas. Mix and match furniture pieces to fill your space. 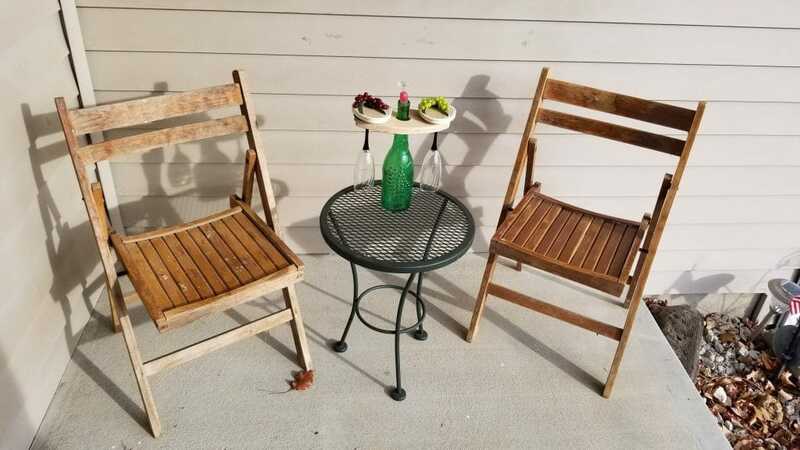 Looking for just a four piece conversation set for your patio or deck area, this set will have two chairs with both arms, a love seat and a coffee table. This traditional conversation layout will fit in medium sized outdoor spaces. Love seat will be the same style of the chairs. Coffee table will be the same table as included in the sofa set above. This set will work well for those with smaller areas that could use seating for four. The teak wood will last very well in any outdoor conditions, cushions should be stored when not in use, to prolong their outdoor life. Available in two styles these teak chairs will give you seating for your outdoor space. Made out of teak wood you will have the choice of a straight leg chair or a folding chair. If you want to hide your chairs away when not needed, the folding chair will is a great option. The straight leg chair will be made with a slated design for the seat and back. Solid arms will give you a place to rest your arms while sitting. Slats will go top to bottom on the back and side to side on the seat. The front of the seat will have a slight down turn for additional comfort. Add some cushions to this chair will increase the comfort level of long term sitting. At 23 inches wide, 23 inches deep and 35 inches tall you will get a standard sized chair to add to your outdoor seating. If you choose the folding chair you will get a smaller chair that can be stored very easily. I have an older set that is very similar to this chair and it holds up very well in outdoor conditions, I use it sometimes on my front porch when I have to put chairs out their quickly for some place to have a casual sitting place outside. Chair will be taller, with a smaller seat. The chair will be 26 inches wide, 24 inches deep and 43 inches tall. Slats will go in the same direction, front to back, on the seat and back. Each of these chair designs will become a chat set with the addition of a side table. The side table for the straight leg chairs will have an open barrel design with four legs that meet on the bottom. It will have slats that are turned every quarter of the top. It will be 27.5 inches across and 29.5 inches tall, a great size for most bistro tables. Table for the folding set will be 24 inches across and 28.75 inches tall. It will fold flat for easy storage. Two sets of legs will have a swivel halfway down for folding. A more open slatted top will have the same pattern for the whole top with a teak wood under frame. It is not too open to let your glass tip over. Choose your style for your smaller outdoor space. Either of these two options will look good on a balcony or front porch. This five piece set will give you a great place to sit and relax on those cool nights. The Gas fire pit will look like an old pirates chest with a round burner and lava rocks in the burn area. Four straight leg chairs with nice off-white cushions will give you a place to sit and relax in comfort. Each of the four chairs will be 28 inches wide, 28.25 inches deep and 32.75 inches tall. Acacia wood will be the base for these chairs with a slate style back and straight arms. Polyester cushions will cover the seats and back for comfort and durability. Cushions should be stored when not in use, to last as long as the wood. The fire pit has the look of an old chest with the weathered wood and black metal highlights. The flame is powered by a 20 pound propane tank (not included) that will fit under the table. A door will allow access to the tank and controls. Square fire bowl will have a round burner. Lava fire rocks will enhance your heat source. This fire pit will keep you warm during moderate cooler temperatures. Fire pit will be 32 inches across and 23.75 inches tall. No cover for fire pit is included. This set will work well for those needing a heating solution to their outdoor space extending the amount of the year they can use it. Adding a lounger to your outdoor space to catch some sun rays by the pool will is a perfect addition to most outdoor spaces. With a teak wood frame, small wheels for mobility, adjustment arms for the back and thick cushions for comfort, you will spend many hours relaxing on your lounger. 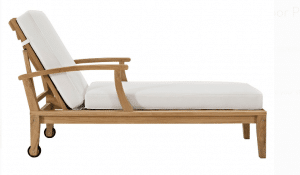 The lounger is 79 inches long, 29.5 inches wide and 12.5 inches tall at the top of the cushion. Cushion is held in place on the back with a strap that goes across the back. This lounger will sit on four solid legs with arched arms to match the armed chairs of this collection. This piece will is a great addition for those looking for a relaxing place to catch sun rays during the summer. I have a set of the folding chairs that I use all the time, see photo above. I can take them to the lake and sit them out in the yard in minutes. These patio furniture sets in teak will offer great solutions for those looking for seating solutions in their outdoor spaces that will last a lifetime. You will never need to replace any of these patio furniture pieces if you take care of them with a coat of teak oil once a year. If you like the more beachy look of driftwood, you can leave the wood to age to a gray patina. You have the choice of how your teak patio furniture will look after a few years outdoors. Want patio furniture that will never need replacing or a lot of upkeep, this is your solution. At a higher cost for purchase, you will buy several other sets before the teak patio furniture will need much care. It is will work in the most extreme outdoor weather conditions. If you would like to add to this post or just have a question for me, drop me a line with the forms below and I will get back to you shortly. Hello John. I like your recommendations. Since I do not have big patio space, the set with foldable chairs is very practical. I have a small backyard garden thus the chairs can be easily carried to the backyard should my better half wants to sit and chat with me there 🙂 I will head to Walmart and check it out. Thanks. Thanks for reading my post and looking at my information. Let me know if I can be any further help while you are looking for your patio furniture solutions. Hi John, I love the teak furniture that you have shared here. You are certainly a connoisseur when it comes to knowing your type of woods. I will certainly go down to Walmart to check them out. Thank you for your perspective.. Thanks for visiting my site. 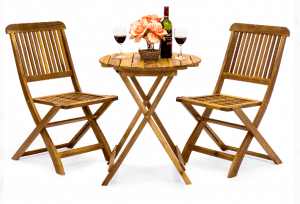 Price is a little high, the Teak wood patio furniture will last a life time. The Modway Marina Patio Teak Sofa Set is just a dream to look at! Makes me long for summer and swimming…while I watch the snow fall outside of my window :). I’ll share these ideas with my mom – she is looking to purchase some new patio furniture soon. If your mom has any questions, let me know. Teak patio furniture is one of the best investments you can make in patio furniture. Thanks for visiting my site. If you have any questions let me know, I will get back to you shortly.